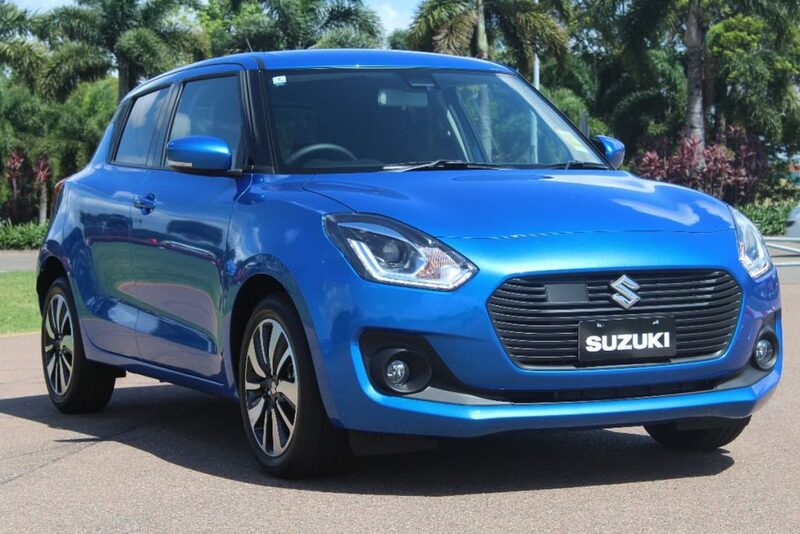 SUZUKI SWIFT GLX TURBO REVIEW – THE POCKET ROCKET! For a long time there were two reasons that a Suzuki Swift was commented on in the Dads Stuff household. Firstly was its long association with the Channel 9 reality show The Block. Contestants would constantly zipping around Melbourne in these cars inevitably stopping at Matt Blatt and wondering if they could fit one of those life sized horse lamps into the back of the hot hatch. Incidently, they never did fit one in the back, but they always seemed to enjoy driving the Swift. Secondly, if you read our Top 5 Car Games you’d know all about our favourite ‘Yellow Car’, which is as it’s title suggests, all about yellow cars. We don’t know if you’ve ever noticed but a large majority of yellow cars on the road are either Suzuki, Ford (trust us, that gold/mustard colour is called yellow) and the occasional Toyota. The Suzuki Swift is a staple and trusted ally of any Yellow Car aficionado. Saying that, we drove a blue one! 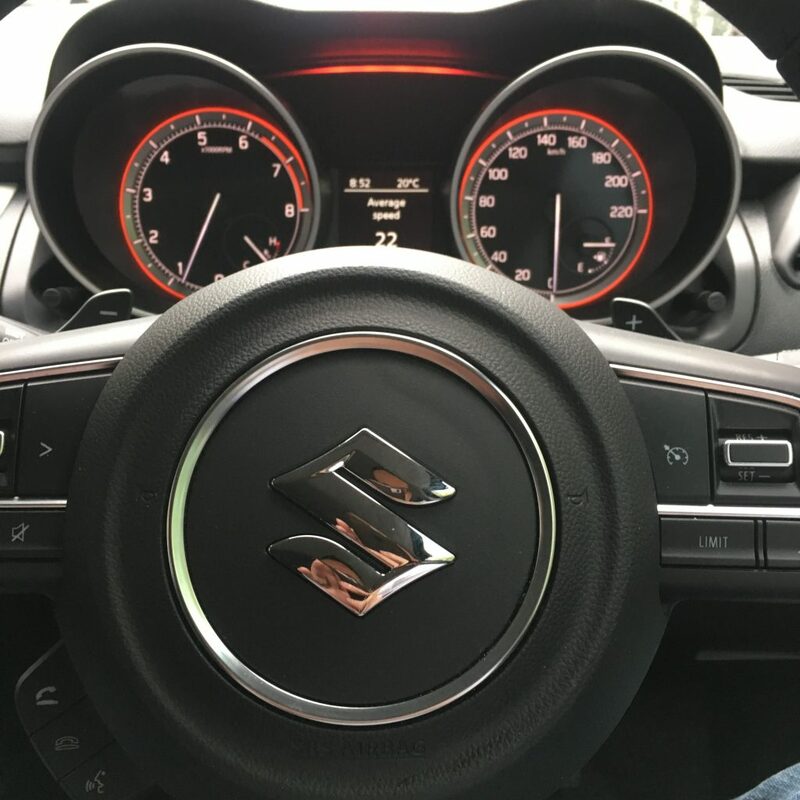 It was with great anticipation that we picked up a Swift GLX Turbo from the great folk at Suzuki Australia, because after all, despite what other cars we test drive, we do love a hot hatch, and this most certainly is. First impressions were the space available… yes it’s a small car, yes you can fit into a whole range of small parking spots, but surprisingly, we found it a spacious interior. A nice surprise to start the drive. Before we set off, we thought we’d check out the entertainment options, plus the control panel. Apple Car Play is awesome, we love it, and to have it in a car in this price range is just as awesome. All round… awesome. 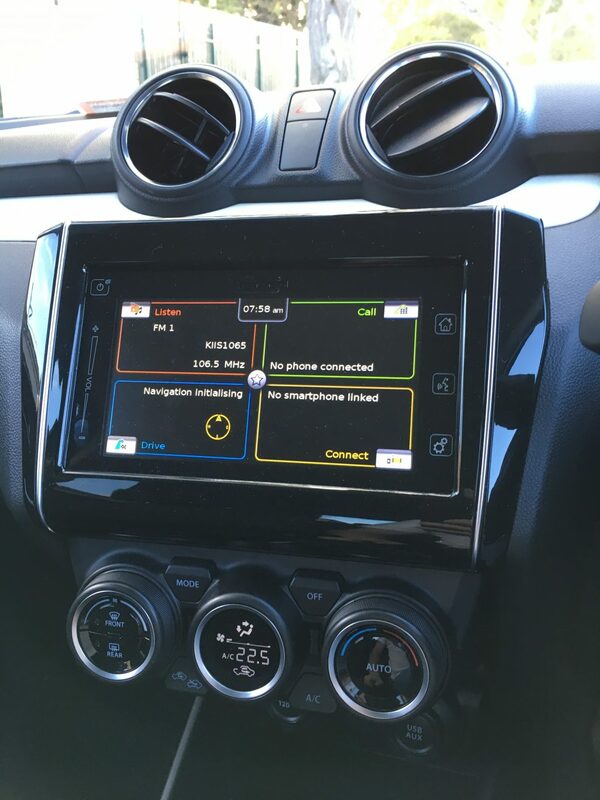 The Sat Nav is easy to use and simple to follow, again, a plus in our book. 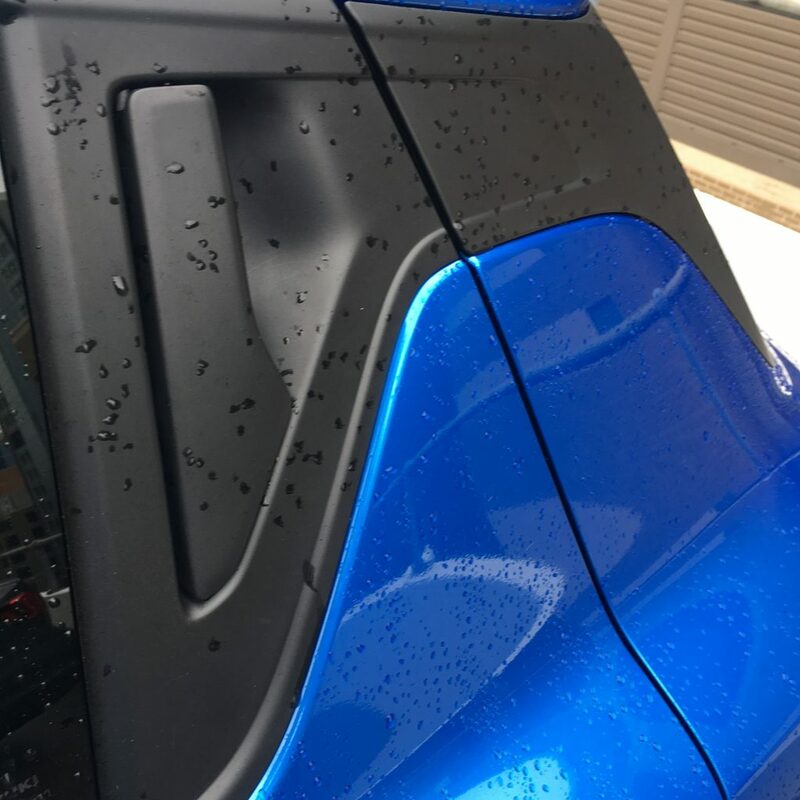 There’s a rear view camera, which from a family point of view and that of all the team here at Dads Stuff is a MUST in all cars, regardless of size, shape or model. So, onto the driving, and this is really where the Swift comes into its own. It’s quick of the mark, comfortable to drive and grips the road well. We’re not saying we drove this thing like Daniel Ricciardo, but when a car of this size and weight has the accelerator pressed in a little, you get a feel for how much power it has, and this feels great. It’s only a 1 litre turbo engine, but it pumps out the power you need to zip around the inner city. It’s perfect for the school run, a quick trip to the Supermarket or a drive to work through traffic. It’s fun… it’s a fun car to drive. There’s even paddle shifts on the steering wheel where you can really take control of this auto when you switch it into manual mode. Like we said, it’s fun. Fuel consumption, as you can imagine is very good, with Suzuki advertising 5.1litres per every 100km. It wasn’t quite that for us, but close enough! From a safety perspective, it’s perhaps surprising the Autonomous Emergency is available in a car which sits in the price range of $20-$25k… it surprised us, but in a good way. This is a big tick for us, and well done to Suzuki on doing this. On the other side of the coin however, is the lack of blind spot indicators which would have been just as handy and are a staple on many new cars these days. Boot space… always a big talking point here on Dads Stuff, and let’s be honest, this is a Suzuki Swift… not a BMW X5 or a Hyundi iLoad. 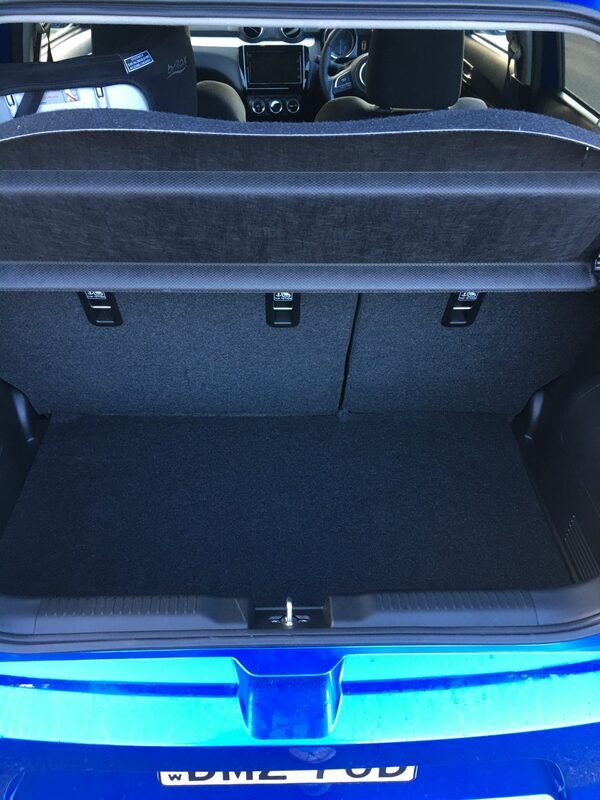 It’s a small hatchback and the boot space reflects that. We still managed to fit a pram, nappy bag and some shopping in there, and to be honest, that’s all we needed. 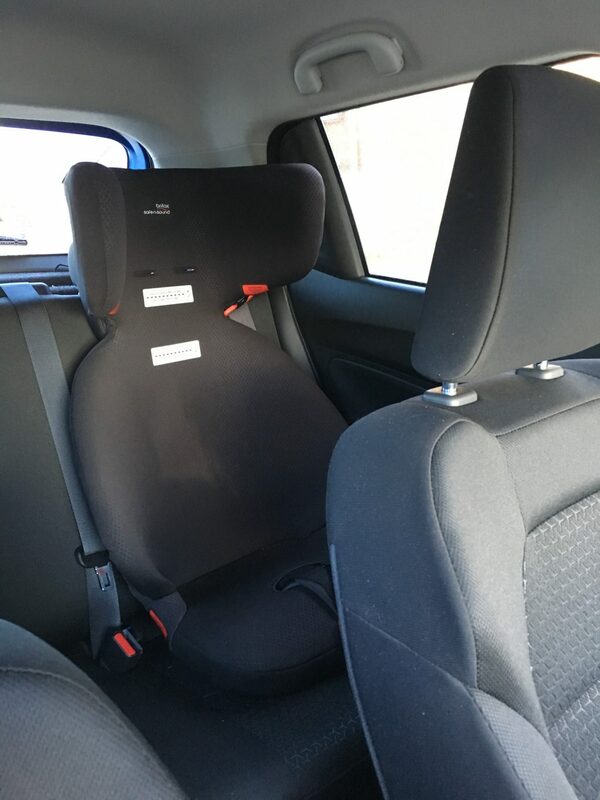 Car seat was comfortable on the back seats and with anchor points for THREE, yes THREE kids seats you could make this a family car (there are anchor points for three, but realistically, this would probably only fit two seats in the back). There’s also some funky little hidden handles for the back doors which add to the sleek look of the Swift. Overall, if you’ve managed to get this far in our review (look, we know it can be difficult when you’ve got kids, you start something and then three hours later you remember what you were doing, only to stand on piece of Lego, which is of course the worst pain you can ever feel* only to forget what it was you started three hours ago.) Anyway, we digress, like we were saying, if you get this far in our review well done and watch out for the Lego on the floor… Anyway, we digress again, well done for making it this far. To summarise, we love the Suzuki Swift GLX Turbo, it’s a fun car, but also a great little car for inner city living, it also works for families, is easy to park, good on fuel and fits all the essentials for daily life. It’s stacked full of safety features and at a price of $23,999 for the top line model, is very affordable. Well played Suzuki… and YELLOW CAR! ← LOVE GADGETS? YOU’LL LOVE THIS WATCH!